Replacing an over the range microwave oven involves two principal steps: Removing the old unit and mounting the new one. 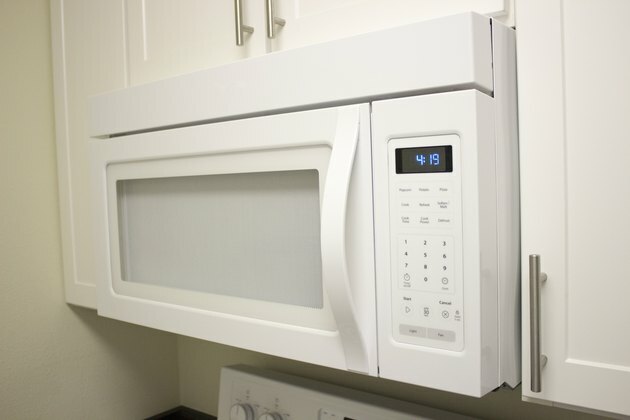 The simplest way to begin this project is to choose an over the range microwave from the same manufacturer that built the existing one because over the range microwaves tend to be standardized dimensionally, but the mounting plates may be different. Open the top cabinet, and unplug the existing microwave. 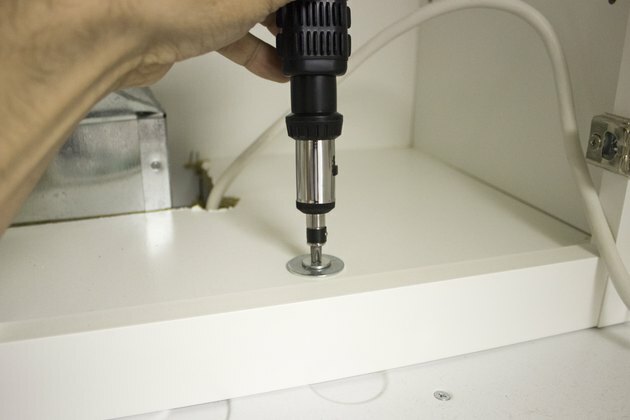 Remove the two outer screws that attach the microwave oven to the top cabinet with a screwdriver. Loosen the center screw. Be careful because the total travel of these screws is usually only two turns. Hold the bottom front of the microwave, and have a helper remove the middle screw. Tilt the microwave so the bottom front drops. Remove any duct tape attached to the microwave. Unhook the back of the microwave from the mounting plate, and lift it off the mounting plate. 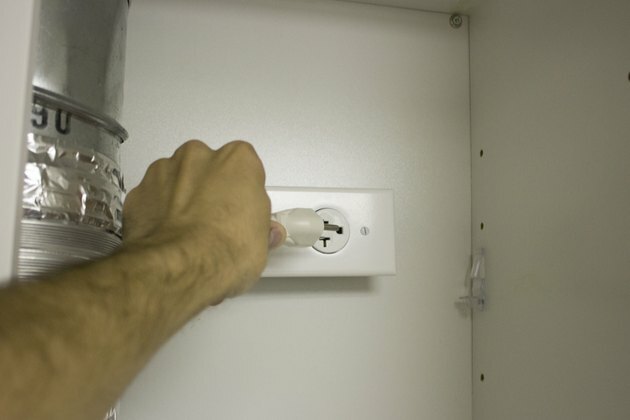 Guide the power lead through the hole in the cabinet. Discard the microwave. Thread the new microwave's power lead through the hole in the bottom of the top cabinet. Lift the microwave, and tilt it forward. Hook the slots at the back bottom edge of the microwave onto the two lower tabs of the mounting plate. Rotate the front of the microwave up against the cabinet bottom. 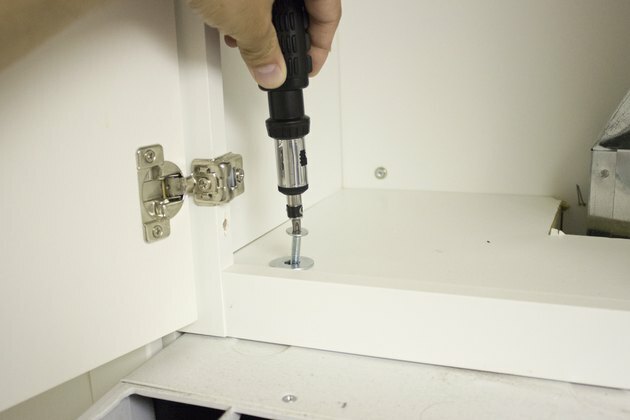 Screw a self-aligning screw through the center of the top cabinet, and temporarily hold the unit in place by turning the screw. Attach the microwave to the top cabinet. Insert the outer two self-aligning screws through the top cabinet holes. Secure them by turning each screw with a screwdriver. Tighten the center screw completely, and tighten the outer screws completely. 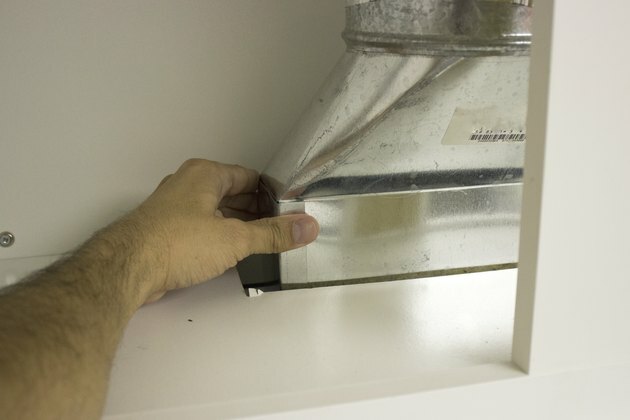 Seal the connection between the vent and the over the range microwave oven with duct tape.